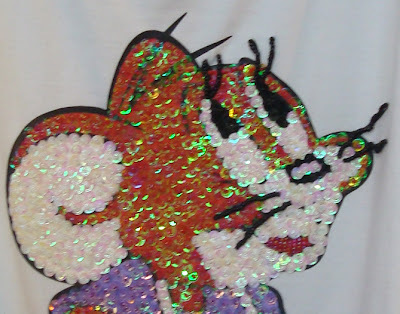 Our favorite cartoon characters can be found on all articles of clothing. They are made for women, like the two examples above, and they are made for men. I've even seen a sequined old-style Batman shirt once. They can appear on inexpensive items like socks. Or they can be quite expensive. I saw a luxury Snoopy sweater with an over 600,000 KRW price tag. If I see that again, I'll make sure to share it with you. Does fashion in your part of the world feature cartoon heroes? I am seeing more and more Family Guy T-Shirts here in USA, and they seem to be more for guys than girls. I dont think that Family Guy is popular in Korea though. Family Guy is MADE in Korea, though. I've only seen Family Guy shirts in American t-shirt stores here. 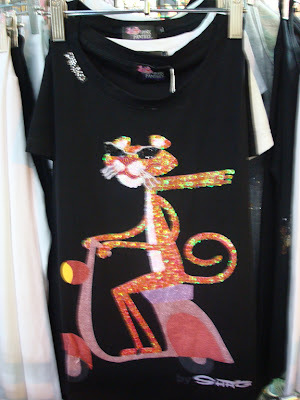 Here's something I noticed: American t-shirts featuring cartoon characters try to be funny or witty. 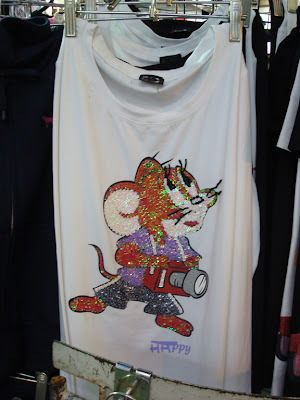 Korean clothes featuring cartoon characters use the characters more like they are brands. I think shirts that have Mickey Mouse on them use the characters more as brands than trying to play a joke. It's almost like a status symbol or like belonging to a club. If you have a Mickey Mouse shirt on and so does your friend, it's like you belong in some secret, Mickey society. Ha ha, Nugget Knight. There's plenty of Mickey around the whole world! I'm trying to find information on an old cartoon I saw while I was in Korea. Paramdori. He blew wind and ate car tires. This was back in 85.